Happy Wednesday! It's halfway to the weekend! Yesterday was my birthday. Sadly, I am officially into my 30's. Last year just scratched the surface, but now there's no turning back! 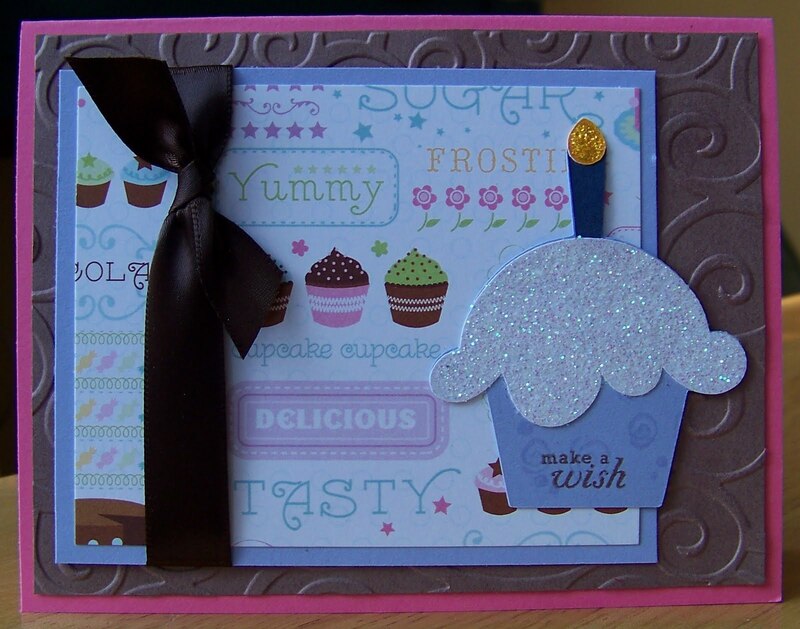 Here is another birthday card using an accent piece from my stash. I love this glittery little cupcake! I used sketch SC13 again on this - it's a good sketch. Supplies are sentiment from PTI, SU cardstock in Pixie Pink, Close to Cocoa and Almost Amethyst. Ribbon and DP are from my stash. Swirled background is a Cuttlebug embossing folder. Super cute card! I love the glitter icing and the dp is adorable. Happy Birthday love!!! Super cute card...that cupcake is cute as can be and I love that DP! Yummy! That's the word that jumps off that fabulous DP!